Since its inception in 1996, Sai Paradise Machine Tools has been serving the industrial sector of India by supplying the sophisticated machine tools having state-of-the-art technology. 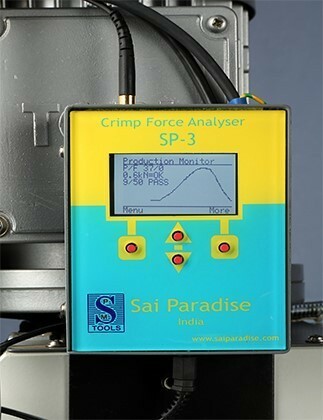 The machines that Sai Paradise produces, manufactures and supplies are of high standards having an improved efficiency in productivity output. The ISO-9001-2010 certification is itself a proof of its adherence to consistent quality standards, and robust design capabilities that fulfilled the requirements of its thousand of its clientele across the world. The commitment shown to our customers in meeting their requirements on time have only made us earned their trust. Their trust and confidence in us has inspired us to further improve the quality of our range of machines and equipments. The entire gamut of wire processing machinery includes Crimping Machines, Applicators, Digital Push Pull Load Testers, Continuity Testers, Wire Cutting and Stripping Machines, Cut-to-length machines, Stripping & Twisting Machines and related peripherals. The consistent quality standards and timely deliveries have increased its clientele base thus earning Sai Paradise, the trust of its customers across the globe. Some of our prominent customers read like who’s who on the Forbes list. They include Dhoot Transmission Pvt. Ltd., TE Connectivity, Alstom Groups, Vinay Group of Companies, Emmerson India Limited, Salzers Group of Companies, PRICOL, Nippon India Limited, Nappino Auto & Electronics Ltd, Kaynes Group of Companies, Phoenix Limited, Blue Star India Limited, Minda Group of Companies, Vi-son Group of Companies, ZF TVS, Tafe, Sudarshan Auto Group of Companies, Star Engineers Pvt Ltd, Wabco Group of Companies, Lumax Group of Companies to name a few. The significant status of success enjoyed by Sai Paradise today is due to our continued practice of delivering quality machineries of highest standards having an improved efficiency productivity output, which only saw the sustained growth of our clients. Our ISO 9001:2008 certification is a testimony of our quality and to maintain our standards, we conduct accurate quality tests various stages to ensure that our range of machines and equipment for wire harness process are high in terms of quality and perfection. We also make sure that the raw material used such as steel and others is carefully inspected at the time of procurement and is procured only from reliable vendors. Next, the quality controllers monitor the production process closely to ensure that our range is free from any kind of flow or deviation ensuring its parity with the international standards. All the fabricated accessories are tested for their strength and durability parameters before they are send to clients. We always strive to be the touchstone of quality and for that we have never compromised on quality. So every effort at our company is directed towards the goal of attaining premium quality in all of our products. Strict quality control procedures adhering to national as well as international standards are adopted at each level of manufacturing process. Our team of quality experts monitor each and every manufacturing process from the procurement of the raw materials to the dispatch of the finished products. They inspect the products on the basis of certain fix quality parameters like dimensional accuracy, durability, power consumption, operational efficiency etc.